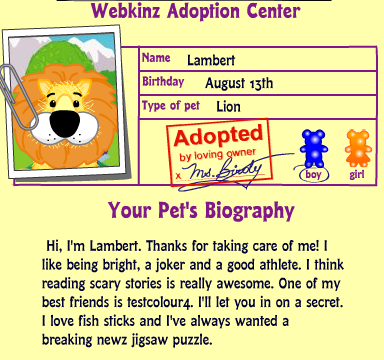 The first adoption for this month’s webkinz purchase. I got the Schnauzer. I like him because it looks like he’s got a little beard. I named him Professor Kirk after the character in the Chronicles of Narnia. The Professor came with a Schnauzer Jalopy and I got the exclusive Toadstool Table with him. The disco ball and 1000kc. Here’s Professor Kirk in the puppy room. 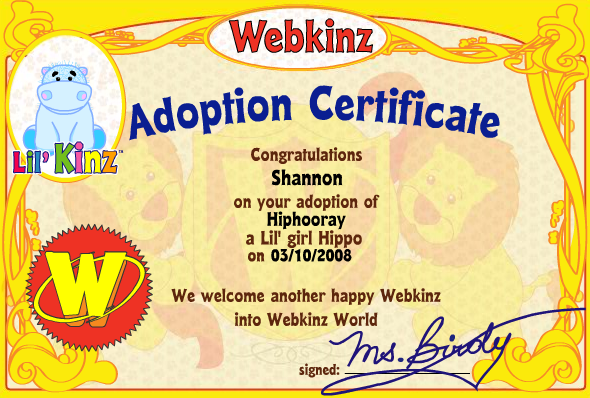 This entry was posted in Journal, Online and tagged webkinz on April 13, 2008 by Shannon. 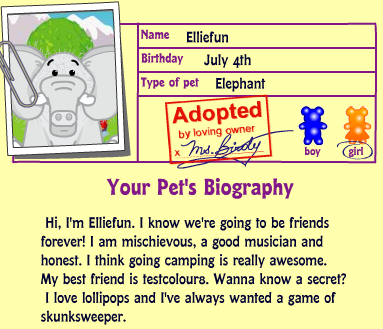 This is my 15th webkinz adoption on this account, and my last one for a while since this is the last one from my recent order that I had yet to adopt. 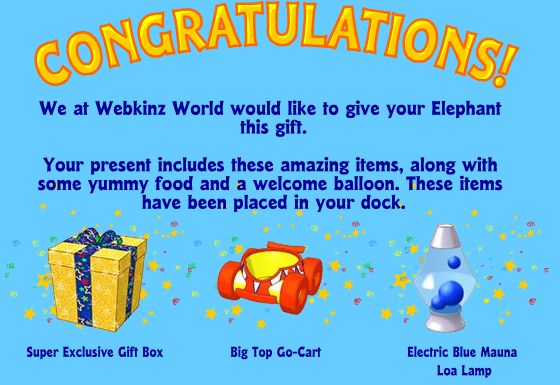 Elliefun came with a Super Exclusive Gift Box, her Big Top Go-Cart, and the Electric Blue Loa Lamp. Here’s Elliefun striking a pose and in her Big Top Go-Cart. 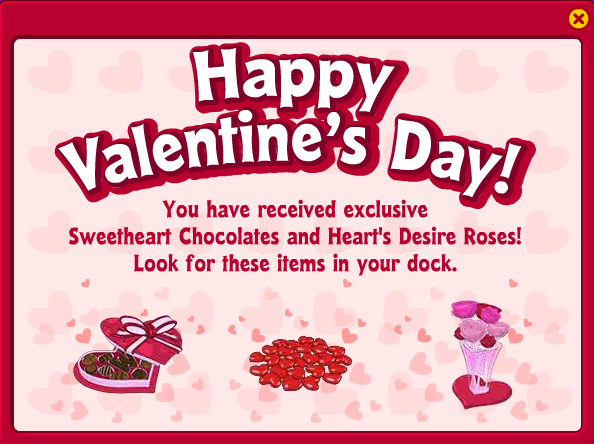 Here’s what I got in my Super Exclusive Box. 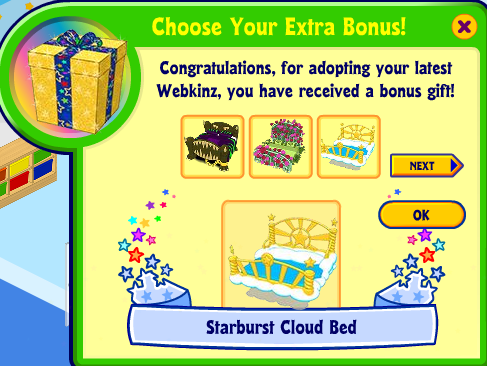 I picked the Starburst Cloud Bed for my Pegusus. Here’s the new bed in my Pony room. It goes really well with the rainbow cloud couch and table. 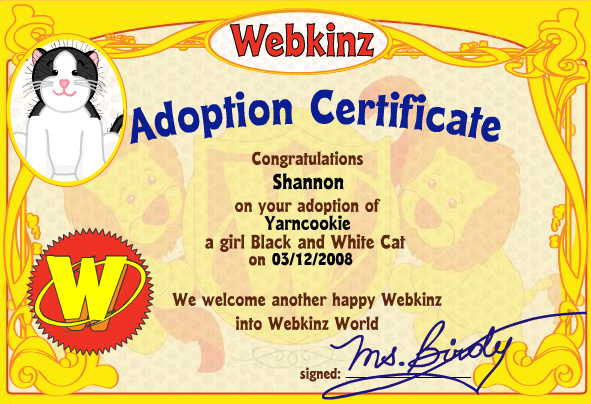 This entry was posted in Journal, Online and tagged webkinz on March 13, 2008 by Shannon. When I saw that the Yellow Lab was retired I ordered one right away before the prices had a chance to go up. 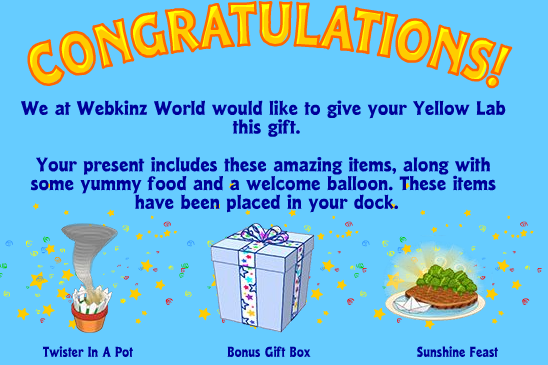 I got some cool things with Honeypaw; a twister in a pot as well as a Bonus Gift. 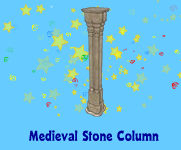 The Bonus Gift Box had a stone column in it. Not sure what it’s for though. Here’s a solo shot of Honeypaw, and that is the Lap It Up Pool that came as the Pet Special Item with my Yellow Lab. I set up a Pirate room for her. This is my first dog besides the pink poodle, so I set up a large room that I can add more puppies into when I get them. 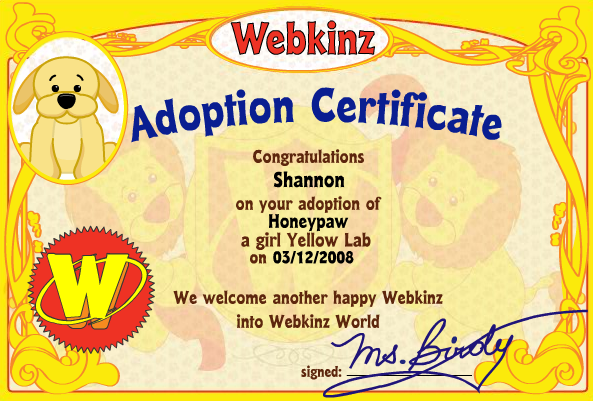 This entry was posted in Journal, Online and tagged webkinz on March 12, 2008 by Shannon. 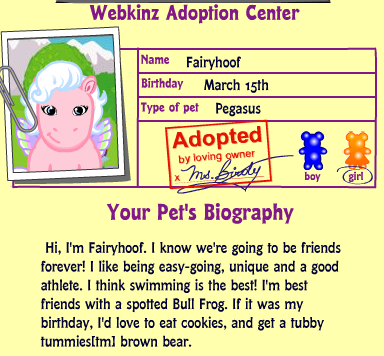 I decided to try adopting one of my new Webkinz into a new account on an Asian time zone so I can play with it while the American time is down for maintainance at 11pm on the West Coast every night and such. I created a new account, choosing my country as Japan and adopted my new Black and White Cat into it. Here are the things that came with my cat. Since it was the first pet in a new account I didn’t get the extra gifts I usually do, but I think it’s worth it. 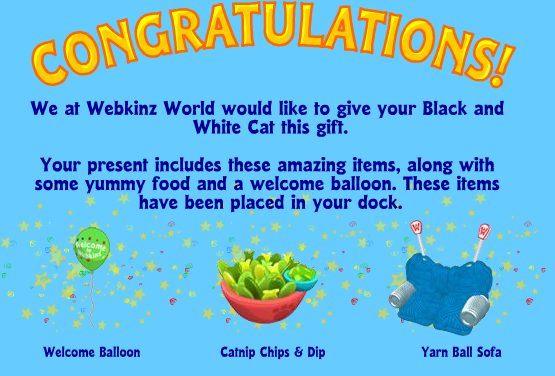 New Webkinz Kitty and In-Home Bowling Alley! 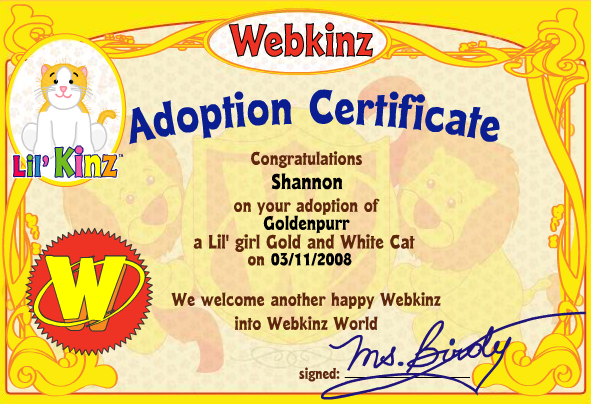 I just adopted my Lil Kinz Gold and White Cat. It was a very exciting one! 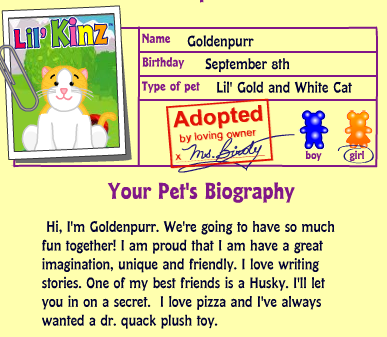 I named my new kitty Goldenpurr. 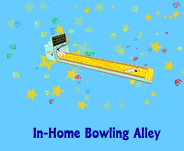 It had an In-Home Bowling Alley in it! 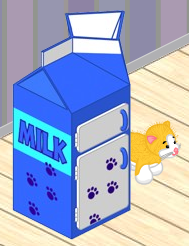 Here’s Goldenpurr with the Milk Carton Fridge which was her special item. Here’s my playroom with the new bowling alley! 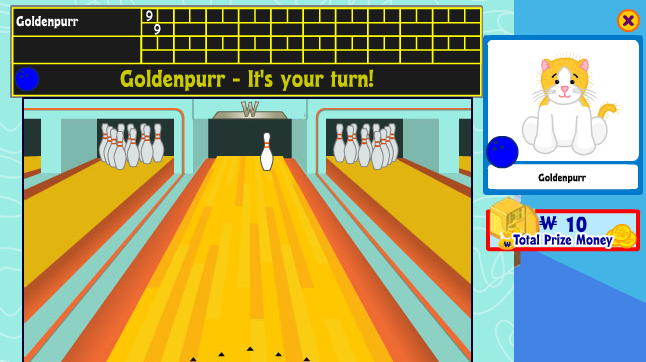 You can really play bowling and win KinzCash with it. 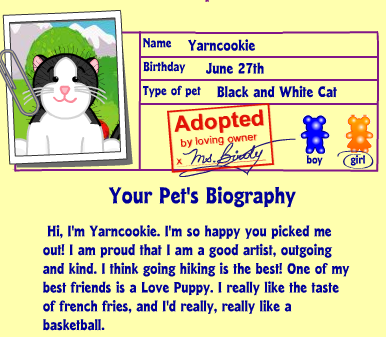 This entry was posted in Journal, Online and tagged webkinz on March 10, 2008 by Shannon. 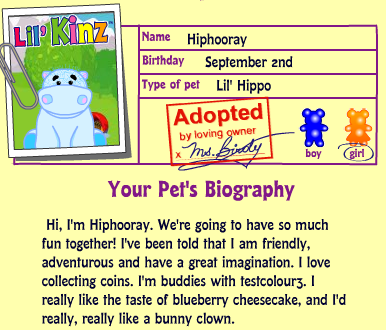 I just adopted my Lil Kinz Hippo. I named her Hiphooray after the Mary Rice Hopkins song that I sing with groups of 2-5 year olds every other Tuesday morning. Here are the gifts that came with Hiphooray. There was a bonus gift box! The bonus box had a 1000kc coin. She looks so small in the kitchen! My hippo also came with this “Wallowing Tub”. 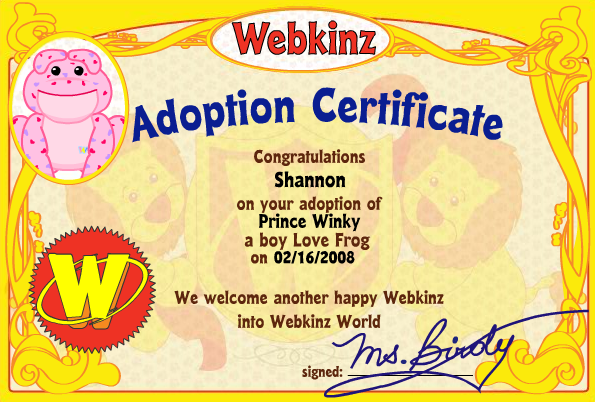 I got the Webkinz Love Frog for Valentine’s Day from Jerrod. 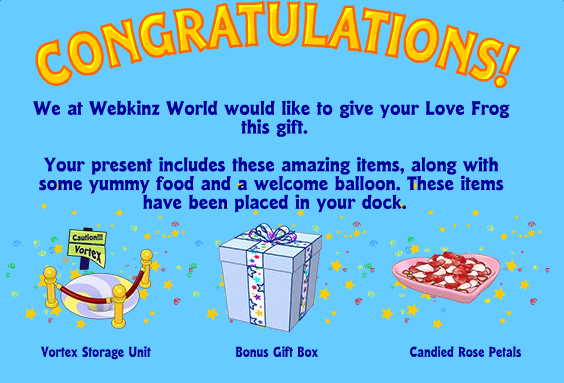 These are the gifts I got from Webkinz for logging in on Valentine’s Day. 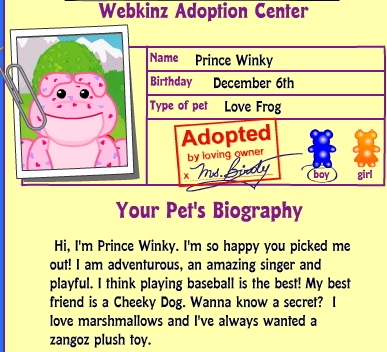 I named my Love Frog Prince Winky after the frog prince and because mine sort of looked like he was winking. 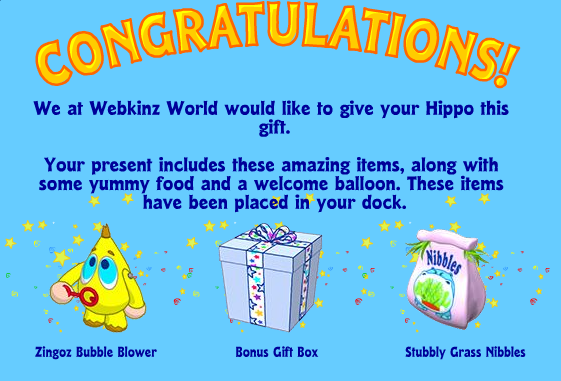 Here are the gifts I got with my frog. I got a bonus gift box! 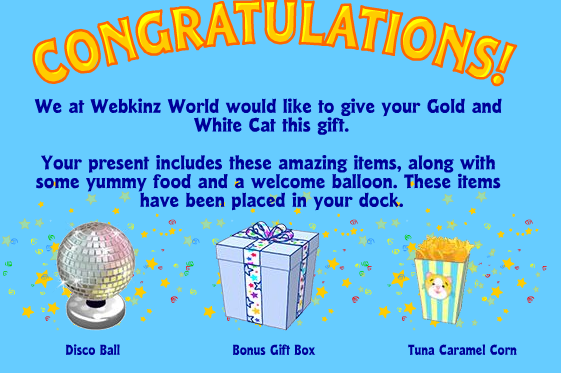 In the bonus gift box was a 1,000kinzcash coin. Here’s a standalone capture of Prince Winky and one with the heart pond with heart-shaped ripples which also came with him. Finally, here’s Prince Winky in the new frog room, including the roses that were part of the Webkinz Valentine’s Day gift. 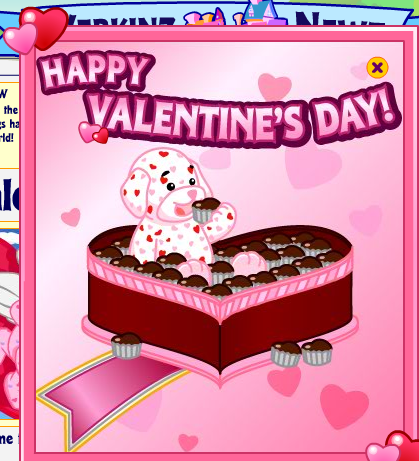 This entry was posted in Journal, Online and tagged Valentine's Day, webkinz on February 16, 2008 by Shannon. 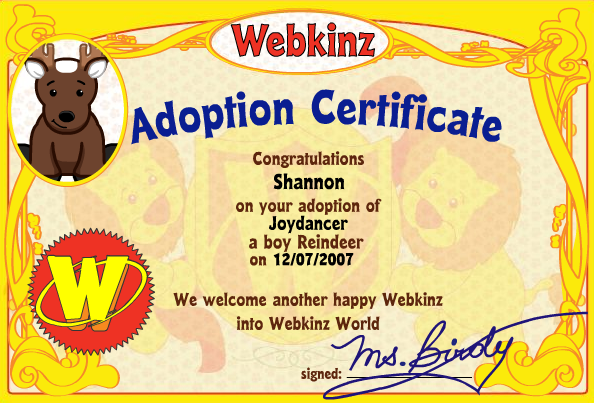 I finally adopted my polar bear and reindeer. 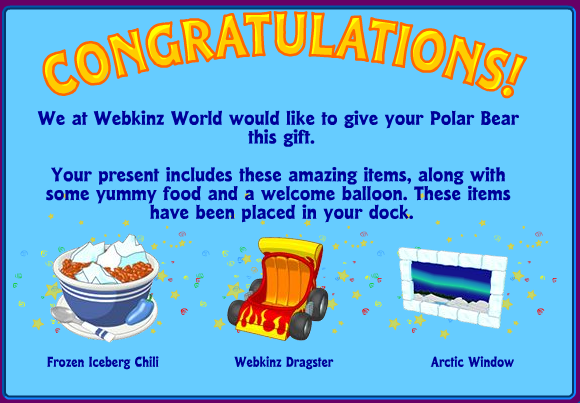 The polar bear special food is iceberg chili, and the arctic window goes great with the winter room theme. 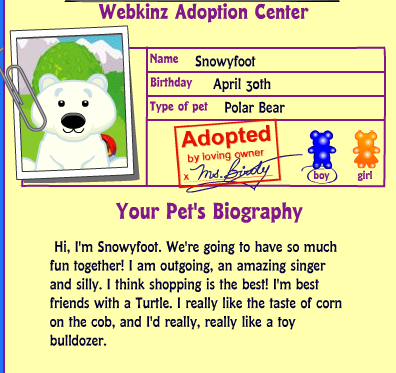 I also got a webkinz dragster with Snowyfoot! And here’s Snowyfoot posing for the camera. 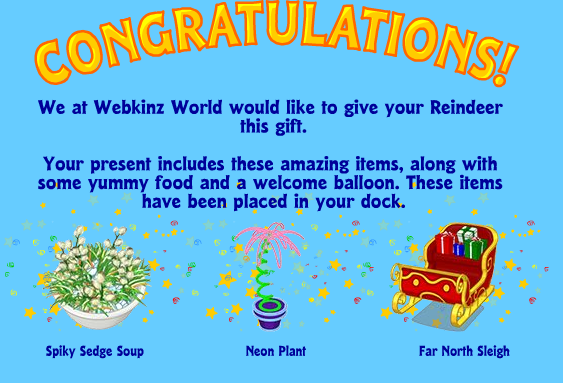 Joydancer came with a lovely sleigh and a neon plant! 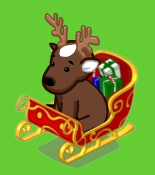 Here he is by himself and in the sleigh. I’ve got both Snowyfoot and Joydancer together in the Winter room. 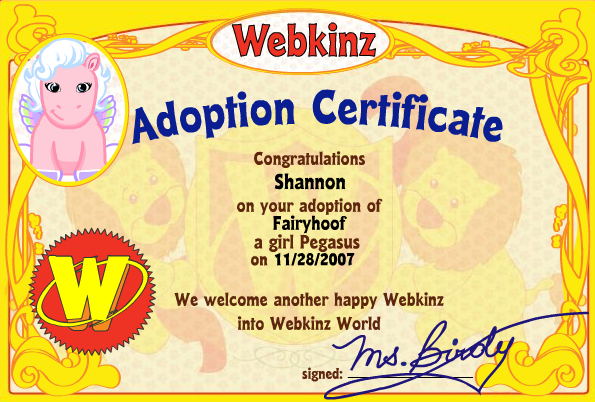 This entry was posted in Journal, Online and tagged webkinz on December 10, 2007 by Shannon. My Pegasus has flown in! I mentioned briefly in my Black Bear post that I had orderd a pegasus on ebay. She arrived today and I just love her. She looks better in person than in the pictures, and is really soft. After struggling to choose the perfect name for my pegasus, I decided on Fairyhoof. Here’s what I got with her. Her special food is really cute looking, and she came with that cool rainbow couch, but I was a bit disappointed that I got the Rainbow Coffee Table again, as I also got it with my black bear. Here are a few different looks at her. 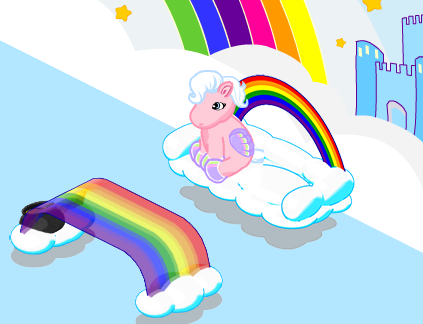 Here she is sitting on her rainbow couch in her room. I decided to build a bigger room to decorate so that I can get the pink pony and lil kinz unicorn later and put them all in a room together. 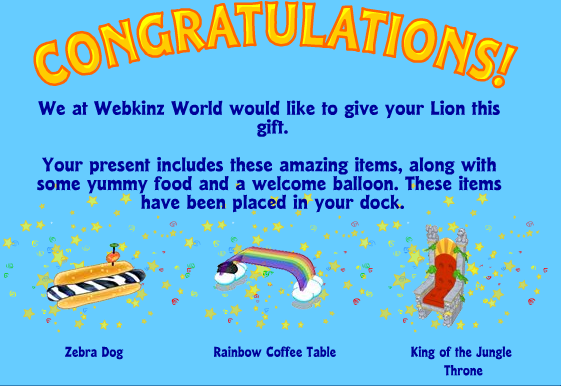 This entry was posted in Journal, Online and tagged webkinz on November 28, 2007 by Shannon. 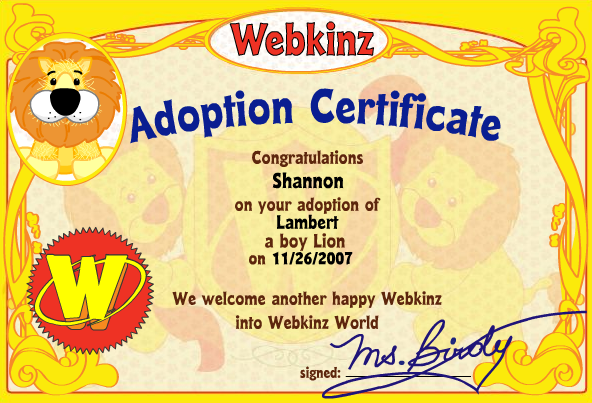 I adopted my lion webkinz today. I named him Lambert after the classic Disney short cartoon, Lambert the Sheepish Lion. If you don’t know what I’m talking about, watch it here. Here’s his bio. Looks like he’s got a testcolour best friend. Now for the fun part, the special gifts that came with him! His special food is the Zebra dog. Even though I can’t stand hot dogs, it’s really cute. 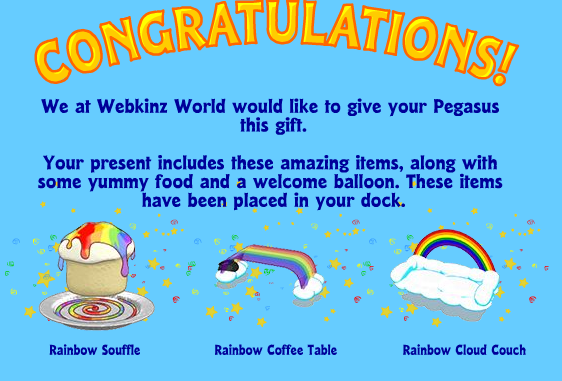 I got the rainbow coffee table which I’m really excited about since I just ordered a Pegasus on ebay and she’s supposed to come with a rainbow cloud couch. 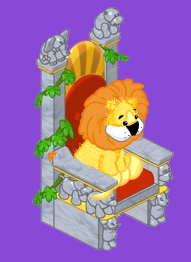 The King of the Jungle Throne looks amazing! And here’s Lambert sitting in his throne, before I decorated the room when it was plain purple. The throne is really cool with animals carved all over. 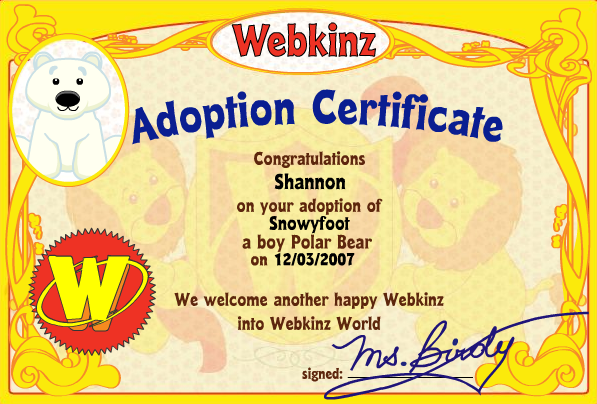 This entry was posted in Journal, Online and tagged webkinz on November 26, 2007 by Shannon.